Here is the thing with me and Stephenie Meyer. I love her writing style. I think that she is talented and brilliant at writing in first person point-of-view. I still love Twilight and reread it right before starting this book, just because I missed the characters and wanted a fresh reference point when reading this “reimagined” version. First thing that surprised me about reading Twilight was how much I missed the scenes that didn’t make the movie. And as much as I loved Edward and Bella, I really missed the Cullens and Charlie too. I am digressing here, but wanted to put it out there what my frame of mind was like when starting Life and Death. Also, there was the Foreword that Stephenie wrote, that made me smile. She even breaks down the changes she made into percentages, which is quite thorough I might add. Completely unnecessary I think, but I appreciate the effort. Beau and Edythe are different people in my eyes to Bella and Edward. They really don’t act or feel like their counter parts. I felt the same way about the other secondary characters, with the exception of Charlie and Renee. She purposefully keeps them the same for reasons that make sense to me. 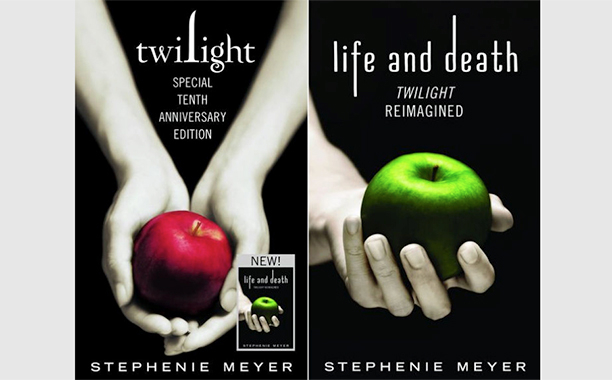 I really liked everyone in the book, but because the original characters’ names and faces were fresh in my mind from rereading Twilight, I got confused a lot as to who was who, because I kept wanting to change them back. Again, everyone’s vampire “gifts” were the same, but handled differently by the characters. It was distracting at times, and made it feel more like fan fiction instead of canon in certain scenes. I still loved the direction that she took the story and the characters. Without giving too much away, it doesn’t go exactly the way you expect. At all. Do I want Stephenie to continue Beau and Edythe’s story? Nope. I’m good. I loved it!! It made me fall in love again with why I love this series so much and why I will always been a loyal fan of her work. The naysayers can take a flying leap for all I care!! I tried to explain impossible things like the scent of creosote–bitter, kind of resinous, but still pleasant–the high, keening sound of the cicadas in July, the gaunt, feathery trees, the enormous sky, extending white-blue from horizon to horizon. The hardest thing to explain was why it was so beautiful to me –to justify a beauty that didn’t depend on the spiny vegetation that mostly looked half dead, a beauty that has something to do with exposed shaped of the land, with the shallow bowls of valleys between the craggy hills, and the way they held on to the sun. I found myself using my hands as I tried to describe it to her. Again, I love her descriptive words that she uses in scenes that are about the landscape or how that landscape affected the characters. This is one of many scenes that blew me away. This book gets 5 brilliant stars, and I put it on my “favorites” and “top shelf fantastic reads” shelf on Goodreads!! This entry was posted in 5 stars and tagged Book Spotlight, favorite author, Favorite books, paranormal, Review, Stephenie Meyer, Twilight Reimagined. Thanks for the review. I started this book, but set it aside. The ‘new” characters haven’t claimed my heart, which felt unfortunate because I’m a huge Stephenie Meyer Fan. You’ve given me hope that will get better.